Ghostbusters: The Video Game is one of my favorite games, currently. I'm not sure if nostalgia has blinded me, but that's very likely. This game does not seek to change the face of gaming -- it was created to appease Ghostbusters fans, and it does so very well. The big question here at Co-Optimus is: does it give us the stellar co-op that a Ghostbusters game of this generation should provide? Ghostbusters: The Video Game is as fun to watch as it is to play. My wife sat on the couch with me until the wee hours of the morning while I searched the public library for the Grey Lady. When your eyes are fixated on your target, it's hard to appreciate the effects from your proton pack as they arc and twist first as an offensive weapon, and then into a glowing lasso. Spectators, however, can attest that this game is pretty, mostly thanks to the particle and lighting effects. While the cutscene animations leave a bit to be desired (What is the fascination these days with full-body gestures? Bill Murray is not a Muppet! ), the in-game banter, the environments, and the tech are very faithful to the films. The new equipment fits right in, and the ECTO-1 has been renamed the ECTO-1B which at one point is used as a large mobile trap. It's still the exact same vehicle we all know and love. Tearing up the ballroom at the Sedgewick Hotel feels exactly like it should. I got a chuckle from my friend when I vaporized a tablecloth and exclaimed, "The flowers...are still standing!" 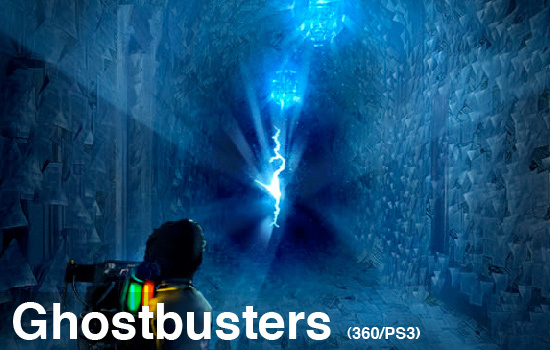 The physics in Ghostbusters seem to be a double edged sword, as certain props in the game seem way too light. Personally, I believe this lack of weight was intentional, because in both single player mode and co-op I find myself grateful that the various debris scattered by my nuclear accelerator doesn't hinder me too badly when I'm running for my life or rushing to revive a team member. This is especially prevalent for the later waves of Survival mode, when the creatures are chasing you...and they're not small. If everything behaved the way it was supposed to, you would be constantly weaving and turning, and moving while trying to trap a ghost would be a complete nightmare. Online co-op changes some of the single player gameplay elements, but the basics are still there. Ghostbusters co-op is drop-in/drop-out in unranked games, so if you find a match that is already in progress, then you can choose your character (the four Ghostbusters and the new rookie are at your disposal) and your preferred weapon type before jumping in. You can revive your teammates just like in the single player campaign, and Terminal Reality really made a nice move when they used crazy spark effects to show your pack shorting out; it doubles as an easy way to locate a downed player. The PKE meter is also available online, and is in fact required in order to enter every enemy into your Tobin's Spirit Guide, as multiplayer features some unique ghosts not shown in the campaign. Page created in 0.2904 seconds.